I am a sucker for charity shop cookbooks. I've gotten most of my Nigella cookbooks this way (doesn't surprise me as she writes beautifully about food but I remain skeptical that she actually tests most of her recipes! The last one was Nigella Express which I haven't opened yet, brand new for £6, along with Heston Blumenthal's In Search Of Perfection, Heston's Fabulous Feasts and a Gordon Ramsay pub food cook book. All pristine, not bad for £20, and Save the Children were very happy too! I picked up Delia Smith's How to Cook 1-3 a few months back as well - good as she actually DOES check her recipes and you can therefore trust her proportions. That exact reasoning has already led me own too many books! I always tell myself when I am done I can just throw the book away (like a magazine), but of course I rarely do. I am getting better though. I am increasingly discriminating at these sales and I've already started gathering titles from some of my neglected hobbies to donate. I've also been putting my beat up trade paperback fiction out with my newspapers for recycling and leaving others in the book "exchange" at work. 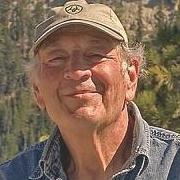 Mostly it seems us older folks add books to it and the younger folks take them away. That is just fine by me though. As much as I like to read books, I've become a bit of a slave to my recipe software. I am too lazy to enter recipes by hand so I typically end up searching for an online version of the recipe. I may not end up with the exact recipe in the book, but I am often led to a variation that I am likely happier with than the original - perhaps something more suitable to my tastes, with easier to find ingredients, easier to make, etc. 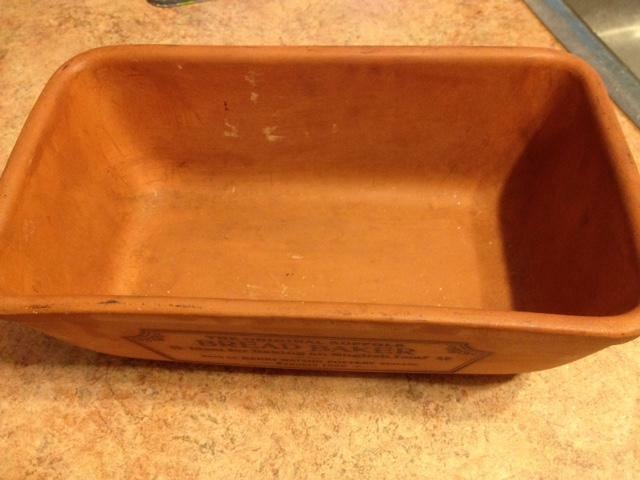 Found this lovely terra-cotta bread pan today in a thrift store. Paid $3.99 for it. Will take it up to Manitoulin and see about making some bread in the (CSO) steam oven up there. 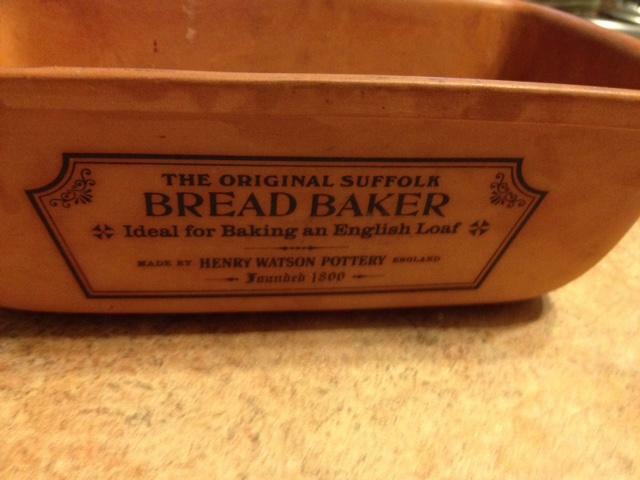 I've got a Henry Watson covered Hot Pot that someone gave me decades ago. I don't think I ever used it. It was sort of a novelty item that I displayed and it held my pottery cookie stamps. No picture. 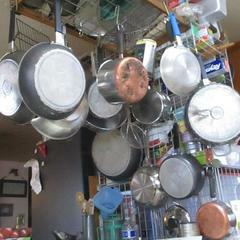 I found a 1 qt Revereware pan, original heavier materials, in excellent shape for $2.00. I myself have no use for it so I will pass it on. 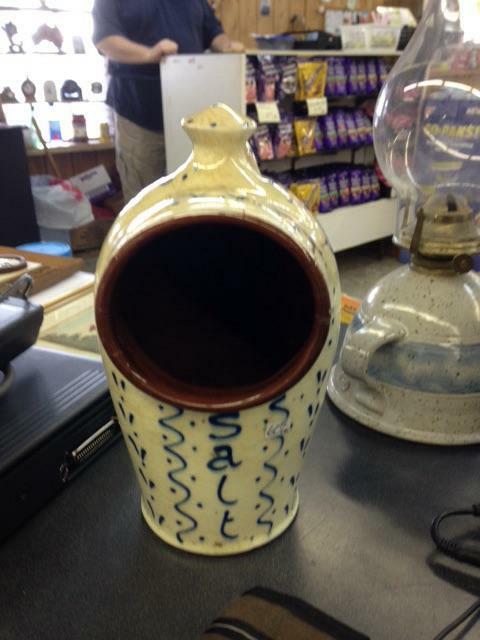 Kerry and I saw this very large salt pig at the flea market in Little Current. 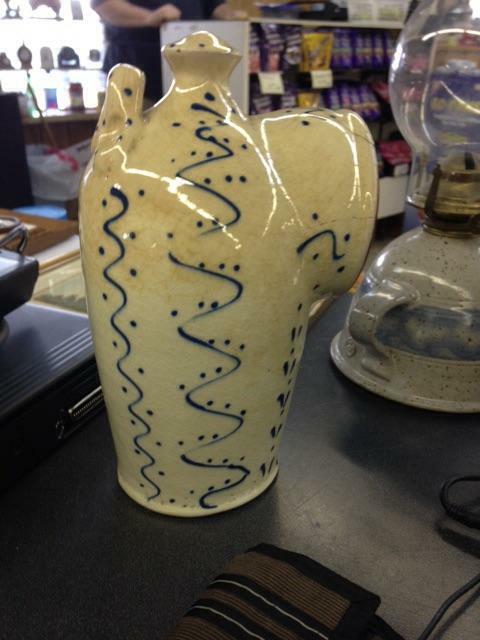 Although we did not buy it because it had a huge crack and was definitely overpriced we are very curious If anyone knows where it might have been made. We cannot read the maker's mark on the bottom. 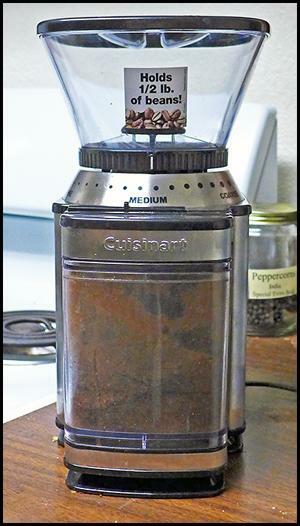 Cuisinart Coffee Grinder: I've been looking for a deal on a halfway decent coffee grinder for some time, and last week I found this one at a neighborhood garage sale. There are probably any number of better grinders out there, but this one works well for my needs. The grind coarseness is adjustable, and after a couple of tries I found the one that works well for my taste and my French press. Best of all, this puppy was only $3.00 ... seemed like a good deal. @Shel_B I have that very same grinder and it has served me well many years. Weekly, I take it apart and give it a good cleaning including using a toothpick to scrape off accumulated ground coffee in the tunnel and in the grinding area. I used to do that with my old Krups burr grinder. Thanks for the reminder. Also glad to know someone else has found this to be a decent grinder. I've been using a similar pan for 35+ years, and recently found a new one, so I now have two plus two small, personal-sized pans as well. Love 'em, even though they don't get used a lot. Don't bake bread too often, but when I do, I use the pans found here.. I had one of these for awhile some years ago. It worked fine. I would run a half cup of rice mixed with a couple of tablespoons of baking soda through it to clean - and then a half cup of plain rice. It worked fine until I knocked it off the counter and several parts shattered. Happy camper here. I recently found a second insert. Having the pan-style handle is so much better that gripping either a pair of "ears" or metal handles with potholders. I sent my 3-piece Bialeti steamer on to a thrift store. I used both of the Revere inserts Saturday night making dinner for my FIL. @andiesenji. Since I have only been finding these steamers recently, can you tell me if these were being made when Revere Ware was being manufactured in the US? I can't answer your question as I lack @andiesenji's knowledge and expertise, but I will offer a data point: I purchased a 4 piece set: 3qt stainless saucepan, steamer insert (with "ear" handles), double boiler insert (with regular handle) and lid in 1978. Used the steamer this AM to hard cook eggs . Not exactly a thrift store thing, but as noted on a thread in the baking forum I scored a Zojirush BBCC-X20 used for $40. Not pennies-on-the-dollar, you understand, but I'll take it nonetheless. @blue_dolphin. Mine from 1978 has the ear handles on the steamer and the double boiler. 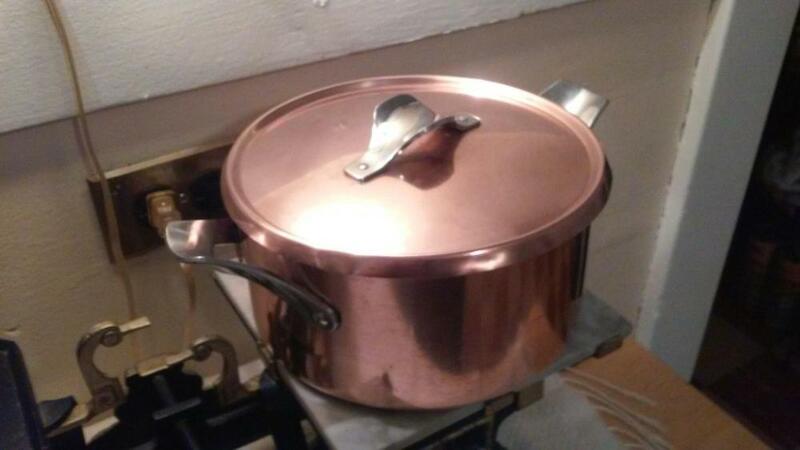 When we purchased another one in 1980 it was just the pan and lid. After scoring my last handled steamer I found a 2 qt stubby sauce pan in great shape for maybe $5, probably less. I am sitting in a Goodwill right now while my wife continues to shop. Today has been good for finding the wooden platters I use in my ren faire kitchens. As an aside the faire near Gilroy I do in the early fall ended last weekend. Yes. They made them in two depths so they could be stacked. I have both somewhere in my junk, although one is missing the handle - I dropped it and it landed on the end of the handle which cracked. Before I got my electric steamer I used it with a "pot grabber" to lift it out. They were made that way so you could steam different items in the two different pans. It was recommended to put meat or fish in the bottom and vegetables or things like potstickers in the top. Well, yesterday I made my weekly trip to Goodwill, and came up empty in the cookware aisle. On a fluke I walked the next aisle over, and found this pristine Georg Jensen Taverna silver-lined 20cm x 12cm x 2mm cocotte with cover, for $39. These 1970s era beauties are hard to find at any price, and it fills a longstanding hole in my batterie. Woot! Much envy here. I love copper. After I took my FIL to the DMV early this afternoon to get a CA ID card (he can't drive anymore and his license had expired) I spent the rest of the day thrift shopping. I came away with multiple finds. 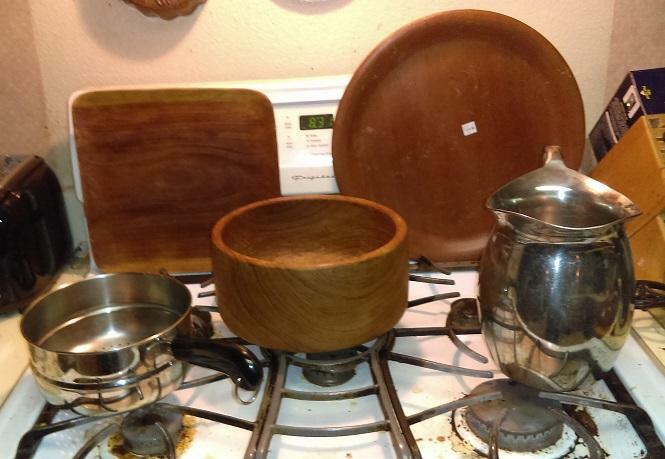 The platters, bowl and pitcher are for my ren faire kitchens for serving, and the Revere steamer insert will go to some friend who uses Revere Ware and likes to steam things. I put the photo up on my Facebok page and within 15 minutes had a taker for the steamer insert. I picked up this Wusthof 6" Classic Chef's Knife for $2.00 this afternoon. The edge wouldn't cut butter right now but after a session on my EdgePro it should be a dandy little knife. Most knives I pick up are purchased with my ren faire kitchens in mind but this one may just find a home in my home kitchen - because I don't have enough knives already . My DW has already shown interest in this knife for her knife block. Yes, we have 2 knife blocks in our kitchen. I'd like one myself except for the bolster...but then for the price it is hard to go wrong. My estimate was correct. I normally can put a new edge on a knife in about 15 minutes. I had guessed that this Wusthof would take about a half an hour**, which it did. It is now in my DW's knife block. A $60 knife for $2.00 and a little labor. You betcha! @JoNorvelleWalker What about the bolster do you not care for?